Attention! I have an announcement. I have earned a highly esteemed award not one, not two, but THREE years in a row. I have yet again won Best Wife of the Year! YEAH! This award was won in 2010 when I surprised Josh with the Grill of his dreams and then again in 2011 when I got him the smoker attachment for dream grill. How did I earn it again in 2012, you ask? Oh, just by being an awesome wife who is keen to what my husband wants. And what does this man want the most in this life? To be a Barbeque Master, to grill like no body’s business, to reign supreme in the smoking wars (smoking brisket, that is). A few months ago I saw a Living Social deal for a 5 hr. professional level barbequing class. Five whole hours with Big Ed from Big Ed’s Buzzard BBQ. Cha-ching! I bought that deal without a second thought. With Josh’s birthday at the end of April, I knew that this was just the thing I needed to get him! I paired it with the Barbeque Bible and this awesome Stainless Steel Hot Dog Roller for the grill (awesome, right?!). I’m not gonna lie, this birthday present will probably benefit me just as much as it will Josh. I can see many, many awesome meals coming from this gift! So, although I’d love to keep on bragging about how great of a wife I am, I’ll digress and get to what I’m really here to share. A few weekends ago we visited my parents and had a fantastic barbeque with them and some of our friends. Without too much effort, my mom whipped up some cheese stuffed hamburgers from a friends recipe. They were so so sososososo good! I cannot emphasize enough how great these things were. I strongly urge you to try this- not only is it pretty foolproof, it’s customizable and sure to please a variety of appetites! 1. Place your ground beef in a bowl and pour milk over the top. Mix to incorporate, cover and refrigerate 1-2 hours. 2. Remove ground beef from fridge and add all the remaining ingredients. The beef should have soaked in most of the milk- if not, drain off excess before adding final ingredients. 3. Scoop out ~2/3 cup beef and pat into 1/2 inch thick, flat, round shape onto wax paper. Repeat to make 2 patties the same size. 4. Place cheese in center of one beef patty leaving a border around the edge. 5. Place other patty on top and pinch edges together. 6. Refrigerate patties until you’re ready to barbeque- this also helps them to set up. 7. Grill over medium heat to your preferred done-ness (we like medium well). 8. Place on bun, top with favorite toppings, ENJOY! These burgers were amazing and I can foresee us having them a lot throughout this summer grilling season! My favorite is the feta burger, Josh’s is the provolone. Hope this recipe helps you woo your friends at your next backyard barbeque! To start off with, I earned Best Wife of the Year in 2010 by surprising my husband with a BBQ he’d been drooling over for 6+ months. While we were away on our honeymoon, I had my dad and uncle assemble the behemoth and place it in our living room. On the flight back from Hawaii, Josh was telling me just how much he wanted to get the grill and how he’d like to start budgeting for it. All the while, his dream BBQ awaited him at home. When he walked into the house his mouth dropped! Hah! I did it! So with the start of 2011, I felt that I needed to continue my reign as Best Wife of the Year. 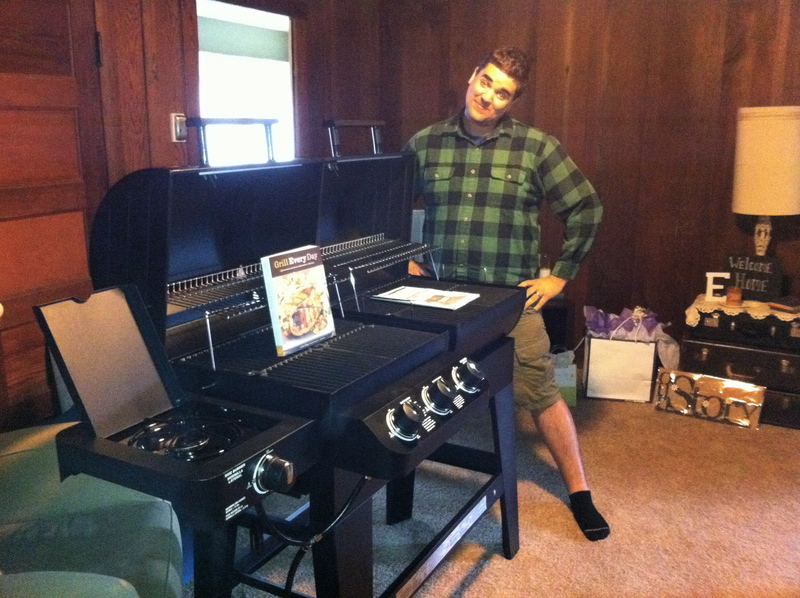 One of the main reasons Josh wanted this BBQ was because you could get a smoker box attachment for it. Being faithful to his Texas roots, he’s had a desire to become a BBQ master and successfully smoking meat is very much a part of that. Josh’s birthday is this coming Friday, so I figured I’d give him a weeks head start on learning the art of smoking meat. On our most recent trip to Home Depot (our second home), I guided him down the BBQ aisle and told him that he was getting his present a bit early! I’m pretty sure he was walking on clouds the rest of that shopping trip! :) And, I can continue my reign as Best Wife of the Year. YEAH! I picked up a 3lb beef brisket from Costco, figuring that J could try out his new toy this past weekend. To say the least, my husband is a natural at BBQ-ing. I’m not sure where he’s acquired these skills, but I don’t argue with them! He mixed up some magic potion and rubbed it all over the beef, slow cooked it for about 3 hrs and ooohhhh my, it was to die for! He’s still learning and has some polishing to do…but man, did I marry well! Seriously! Keep an eye out for a guest blog by Mr. Edwards about the art of smoking meat. You won’t want to miss it! 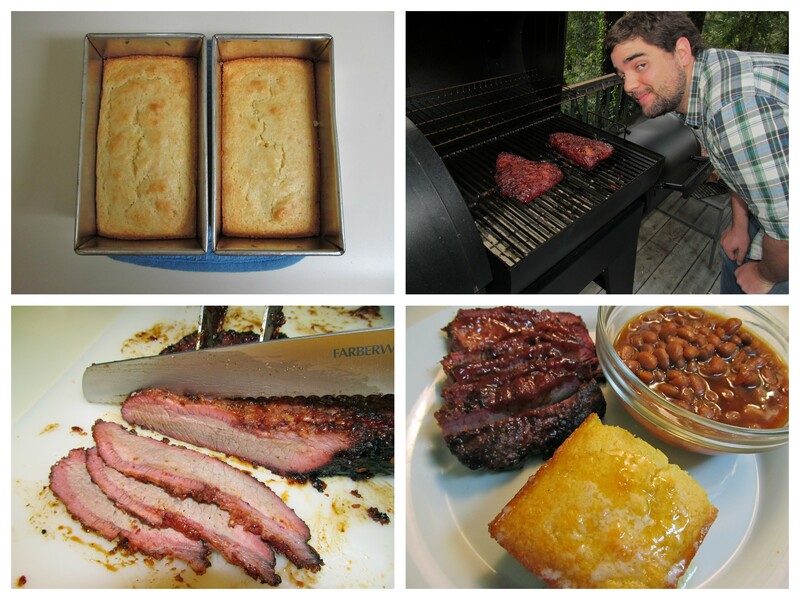 To go along with the amazing BBQ Brisket, I made some honey corn bread and some baked beans. (Yes, I know there isn’t a vegetable on that plate, but I’m not crying about it. We’ll eat extra tomorrow, I promise.) The corn bread is a simple Jiffy Corn Muffin Mix split between two small loaf pans. I baked it exactly to the instructions and added way too much butter and honey on top after it was done. SO GOOD! For the baked beans, I just use Bush’s Home Style beans and add some extra lovin’ (a 1/4 cup of brown sugar and about 2 teaspoons of Worcestershire sauce). The sides were super simple, but were a perfect match to the smoky, mouth watering brisket. The best part of this meal is that we have leftovers for sandwiches this next week. YES! I found a recipe on allrecipes.com for Zesty Slow Cooker Chicken Barbeque. Sidenote…allrecipes.com is a-maze-ing. Seriously, you should check it out! I use recipes from there about 3 times a week and haven’t found one we don’t like yet! It pays to read user reviews and suggestions though. Back to the point…I found the recipe for the BBQ chicken, thought it sounded pretty fool proof and dove right in! It only calls for 5 ingredients, how could even I mess that up?! Frozen boneless, skinless, chicken breasts, bottle of BBQ sauce, Italian salad dressing, Worcestershire sauce (I can never ever say that correctly), and brown sugar. Easy, right? Yeppers. 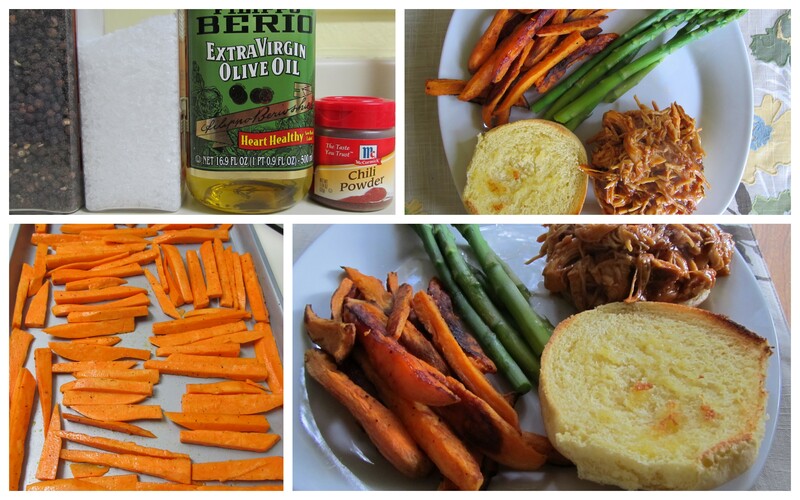 With high hopes for the chicken, I went to work on the second portion of our dinner, sweet potato fries! Seriously such an easy thing to make! My version started off as this one, found at…you guessed it, allrecipes.com. But, with the help of my Mom, it has morphed into something super simple and super awesome. Our version has just 5 ingredients- sweet potatoes (ok, ok, they’re yams), salt, pepper, olive oil and chili powder. Peel and cut the potatoes into fries, place in a zip-lock bag, add about 2 Tbsp. olive oil, 1 tsp. each salt, pepper, and chili powder. Shake-shake-shake, spread into one layer on a sheet pan and bake in a preheated 425F oven for 20ish min. Flip the fries and cook 15ish min. more. (I say “ish” because it varies to how thick your fries are…just cook ’em until they’re tender and toasty to your liking). Voila! Sweet potato fries! Note: they will be significantly softer than ones you’d get at a restaraunt because they aren’t deep fried. I actually like this version better!